The Lilliput UM900/T is a 9.7 inch 4:3 touchscreen monitor with USB and HDMI input. Tested for optimal performance with Apple products. PLEASE NOTE: Unlike other DisplayLink type monitors, the UM900 requires an external power supply which is provided with the unit. Please take this into account when ordering. Natively 1024×768 pixels, UM900 provides a crystal-clear picture. With USB display technology, every pixel perfectly fits on the display. Thanks to advanced IPS display technology, colours look their best on UM900. With a 900:1 contrast ratio, your video content looks at its best. A further benefit of IPS displays is wider viewing angles. UM900 features the widest viewing angle of all Lilliput USB monitors. Wider viewing angles are particularly useful in point-of-sale applications and digital signage because your content maintains its clarity at all angles. Many customers request a monitor with clean borders and no front-facing buttons. UM900 has the cleanest face of any Lilliput monitor, which allows viewers to focus purely on the content. UM900 has been designed with AV integrators and digital signage applications in mind. The industry standard VESA 75 mount opens up a world of possibilities, but the included desktop stand also allows the UM900 to be used as a regular desktop companion. USB video has helped thousands of Lilliput customers around the world: it is convenient and easy to set up. 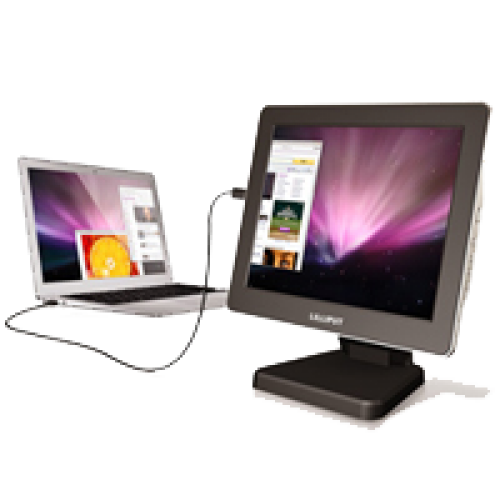 UM900 uses a mini-USB video input, and features one additional regular USB port that acts as a hub.